Ichiro Suzuki was born on October 22, 1973 in Honshu, an island about 150 miles southwest of Tokyo, Japan. If Ichiro didn’t already possess an instinctive love of baseball, his father, Nobuyuki, and mother, Yoshie, made sure he developed one. Indeed, they planned for him to become a professional baseball player as soon as he entered the world. Nobuyuki pushed the hardest. He owned a small cooler repair factory in the town of Toyoyama, but spent most of his free time watching and studying baseball. His favorite team was the Chunichi Dragons, who played in the nearby city of Nagoya. 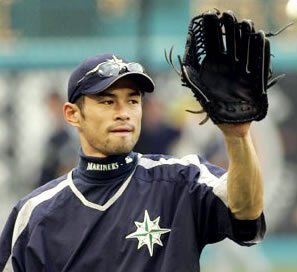 Ichiro received his first baseball and glove after his third birthday. To this day, he talks about the gifts as though they were treasures. Ichiro joined Little League when he was six, even though he was two years younger than the league’s minimum age. He skirted the rule thanks to his dad, who coached his team. The elder Suzuki signed up his son under an assumed name, and Ichiro was so talented that no one questioned the fact that he was by far the smallest boy in the league. Nobuyuki tried to give Ichiro every advantage possible on the diamond. That included turning him into a left-handed hitter. Though Ichiro was a natural righty, he learned to bat from the opposite side of the plate to make best use of his speed. Nobuyuki also taught his son the mechanics of pitching and the value of fitness and proper eating habits. Every afternoon until he reached the 7th grade, Ichiro practiced with his father at a nearby field. A typical session included throwing from the pitcher’s mound and a long stretch of batting practice. They also visited the batting cages together. The fastest machine threw 75 mph. By the time he was 12, Ichiro was setting up several feet in front of the plate to simulate faster pitching—and still getting good cuts. He began to think he might have a future in baseball after watching the star of the local high school team at the cages. He was a good five years older than Ichiro, but didn’t seem that much better. No user commented in " Ichiro Suzuki "